The AnyTour E+ has a comfortable, sporty and quiet feel with an 80Nm SyncDrive Sport motor that offers up to 350 percent tunable support ratios. You can fine-tune it for the riding characteristics you prefer. It has a 60mm suspension fork with a hydraulic lockout so you can adjust to the road conditions. A great choice for trekking, it has a 500Wh EnergyPak that can take you far. 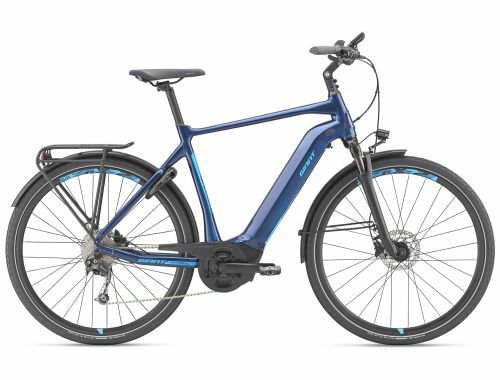 The battery is seamlessly integrated into the downtube for a sleek profile, and the RideControl EVO offers navigation features with a clean handlebar mount. 80Nm SyncDrive Sport motor offers up to 350 percent tunable support ratios, so you can fine-tune it for the riding characteristics you prefer. The RideControl EVO offers navigation possibilities and is cleanly integrated into the handlebar. The low-step-through design makes it easy to mount and dismount and produces a confident, comfortable ride.